The Judith C. Jones Fellowship for Trainers of Color supports trainers and organizers of color working in left and social justice movements. This year, five new and dynamic Fellows joined the program and we’re excited to support their growth over the next year. The Fellowship is grassroots funded - each donation goes a long way to support in-person retreats, scholarships to TFC workshops, webinars, and one-on-one coaching sessions. Thanks for making the program possible this year! Fellows are doing a range of powerful work, including training popular movements, labor and migrant justice organizing, dismantling the prison industrial complex, leading bail out projects to decarcerate Black mothers, and community organizing for queer and trans communities. They bring relationships and leadership positions at Momentum, The Audre Lorde Project, Black Youth Project 100, Good Jobs Now, Public Service Alliance of Canada, and Justicia 4 Migrant Workers. The 2019 cohort launches this Spring at their first in-person retreat, where they will learn about each others’ work, build skills, and set goals for the rest of the year. Thanks for donating and supporting our Fellows! Any amount you can support is appreciated! Become a Monthly Sustainer. Thanks to support from the Fund 4 Democratic Communities, if you become a TFC Sustainer this year, your donations will be matched up to $100. Our goal is to welcome 10 new Sustainers during the JCJ Fellowship Fundraiser. Can you be one of those? Sustainers give anywhere between $5 and $60 a month, and play a foundational role keeping programs like the Fellowship sustainable. Check "I want to contribute this amount every month" to become a Sustainer today. 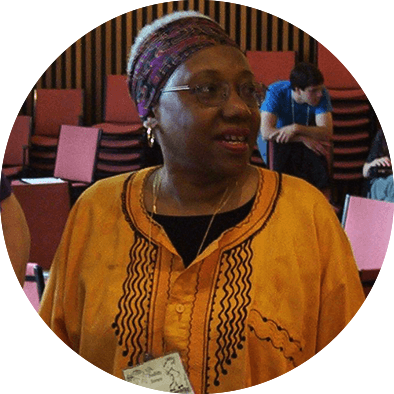 Judith C. Jones This Fellowship program is named in honor of TFC Training Elder Judith C. Jones, Ph.D. Judith worked with Training for Change for over a decade as a former lead trainer. She grew up in Philadelphia, received her doctorate in Political Science from Atlanta University and has taught at Penn State University and at Philadelphia University. Judith is also co-author of Two Voices from the Front Line: A Conversation about Race in the Classroom, an article found in the award winning anthology Race in the College Classroom. She's led diversity and conflict workshops for a diverse client base and has served as a guide and role model to many of us who have worked with her as up-and-coming trainers.